Led by demand for aircraft and automobiles, durable goods orders rose 1.2% in December for the second consecutive gain. Excluding the monthly volatile transportation categories, orders rose 0.1%, indicating slight progress in the manufacturing sector, the Commerce Department reported. Year-t0-year, overall orders increased 8.1%, vs. 7% excluding transportation. 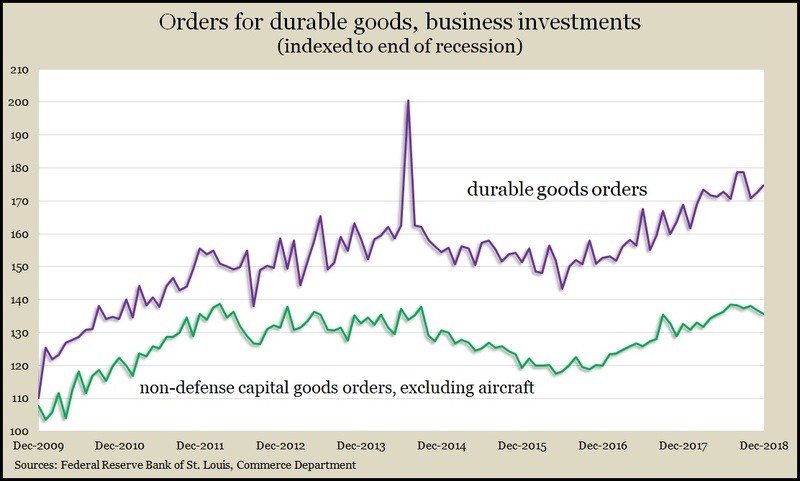 A sign of business investment – non-defense capital goods orders excluding aircraft – fell for the second month in a row and the fourth time in five months, suggesting a lag in corporate commitment. The measure was up 6.1% from the year before. The four-week moving average for initial unemployment claims rose for the fourth week in a row to the highest level in 13 months. Meantime, weekly claims declined, suggesting the four-week average probably was inflated by ripple effects from the recent federal government shutdown. According to Labor Department data, the level of jobless applications was 33% under the 52-year average, showing reluctance by employers to let workers go, which could encourage consumers to spend more. Consumer spending drives about two-thirds of U.S. economic activity. The National Association of Realtors said the average annual rate of existing home sales declined 1.2% in January, the third decline in a row. The trade group contended the slump in real estate could be short-lived, citing moderating price gains and rising incomes. The median home price rose 2.8% from January 2018, for the 83rd consecutive year-to-year increase. The sales pace for homes fell 8.5% from the year before. The Conference Board’s index of leading economic indicators slumped by 0.1% in January. The business research group said the index has been moving sideways since October. A rise in financial components of the index in January was offset by weaker labor market measures, which could have been affected by the partial government shutdown. The Conference Board forecast that U.S. economic growth will cool to 2% in 2019.